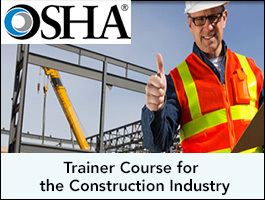 The OSHA #500 course is designed for individuals interested in teaching the OSHA 10- and 30-hour construction safety and health Outreach Training Program to their employees and other interested groups. Using OSHA Construction Standards as a guide, special emphasis is placed on those topics required in the 10-and 30-hour programs as well as those which are most hazardous. Students are briefed on effective instructional approaches and use of visual aids and handouts. This course allows the student to become a trainer in the OSHA Outreach Training Program, to conduct both 10-and 30-hour Construction Outreach classes, and to issue cards to participants after verifying course completion. · Completion of the OSHA #510 Standards for the Construction Industry (copy of completion certificate required). · A complete Prerequisite Verification Form must be submitted at least 7 business days prior to class. Approval can take up to 7 business days once the complete Prerequisite Verification form is received.